Medical Herbalism contains comprehensive information concerning the identification and use of medicinal plants by chemical structure and physiological effect, the art and science of making herbal medicine, the limitations and potential of viewing herbs chemically, and the challenge to current research paradigms posed by complex plant medicines. It also includes information on toxicology and contraindications, the issues involved in determining dosage and formulation types for an individual, guides to the different measurement systems and conversion tables, and the pros and cons of both industrial and traditional techniques. With additional sections devoted to the principles of green medicine, the history of Western Herbalism, the variety of other medical modalities using medicinal plants, an extensive resource directory, and a discussion of treatments organized by body system, Medical Herbalism is the comprehensive textbook all students and practitioners of clinical herbalism need to develop their healing practices. MEDICINE / HOLISTIC HEALTH Medical Herbalism is a foundational textbook on the scientific principles of therapeutic herbalism and their application in medicine. 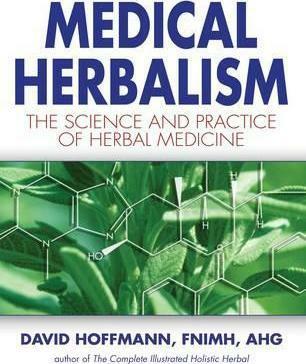 Based on the author's more than twenty-five years of herbal practice, it contains comprehensive information concerning the identification and use of medicinal plants both by chemical structure and physiological effect, the art and science of making herbal medicine, and the challenge to current research paradigms posed by complex plant medicines. The author details the intricate chemistry behind herbalism, providing for the first time important background and insights into how herbal remedies are able to achieve their results and the limitations and potential of viewing herbs chemically. He then presents in-depth discussions of specific ailments and treatments organized by each of the major body systems, as well as delving into the special needs of children and the elderly. He includes the most up-to-date information on preparations, dosage, and contraindications; information on toxicology and the issues involved in determining dosage and formulation types for an individual; and the pros and cons of both commercial and traditional techniques. His materia medica presents 150 of the most beneficial herbs used in treatment practices, identifying not only their present uses but also their historical derivations. With additional sections devoted to the principles of green medicine, the history of Western herbalism, the variety of other medical modalities using medicinal plants, and an extensive resource directory, Medical Herbalism is the comprehensive textbook all students and practitioners of clinical herbalism need to develop their healing practices. It is also a complete handbook for the medical practitioner looking to bring herbal treatments into his or her practice. DAVID HOFFMANN, a Fellow of Britain's National Institute of Medical Herbalists, has been a clinical phytotherapist for more than twenty-five years. He started his herbal practice in Wales, continuing at the Findhorn community in Scotland, and has been practicing in California since 1986. A long time activist in the environmental and peace movements, he ran for parliament in Britain for the Green party in 1983. He is one of the founding members and a past president of the American Herbalists Guild and is on the advisory boards of the American Botanical Council and HerbalGram. The author of seventeen books, including the highly regarded The Complete Illustrated Holistic Herbal, An Elders' Herbal, and The Herbal Handbook, Hoffmann teaches phytotherapy throughout the English-speaking world and is currently a faculty member of the California School of Herbal Studies. He is also a visiting faculty member at Bastyr University, the California Institute of Integral Studies, the National College of Phytotherapy, and the Rocky Mountain School of Botanical Studies. David Hoffmann, a Fellow of Britain's National Institute of Medical Herbalists, has been a clinical phytotherapist for more than twenty-five years. He started his herbal practice in Wales, continuing at the Findhorn community in Scotland, and has been practicing in California since 1986. A long time activist in the environmental and peace movements, he ran for parliament in Britain for the Green party in 1983. He is one of the founding members and a past president of the American Herbalists Guild and is on the advisory boards of the American Botanical Council and HerbalGram. The author of seventeen books, including the highly regarded The Complete Illustrated Holistic Herbal, An Elders' Herbal, and The Herbal Handbook, Hoffmann teaches phytotherapy throughout the English-speaking world and is currently a faculty member of the California School of Herbal Studies. He is also a visiting faculty member at Bastyr University, the California Institute of Integral Studies, the National College of Phytotherapy, and the Rocky Mountain School of Botanical Studies.